Hey, who ate my toast? It was me, I did it. Obviously. Oh. You’re supposed to try and blend in, not get caught. Yeah, but what are you going to do about it? I’m a dragon! Battlestar Galactica is one of my favorite games; it blends an incredibly challenging cooperative scenario in an extremely thematic world that captures the feel of the television show. Oh, and betrayal, lots of betrayal. For some reason I really enjoy a bit of treachery in my board games. But there’s no denying that it can take many hours to play, and while we like to make an event of it sometimes, I don’t get to play as often as I’d like simply because of the time requirements. 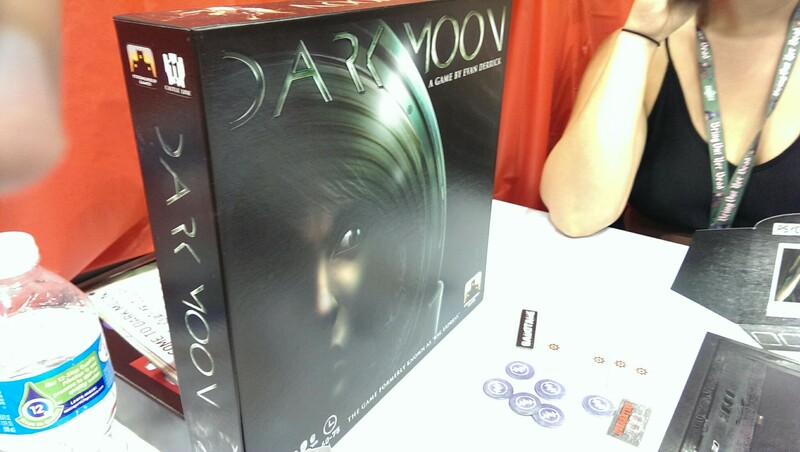 Enter Dark Moon, a newly published game from Stronghold Games. Let me tell you a short story: once upon a time, there was BSG Express, a fan-made print and play version of Battlestar Galactica that condensed the rules and components of BSG into a much shorter, compact game that still had missions and characters and events and betrayal. Of course, the game wasn’t fully refined, the designer didn’t really have the BSG license, and PnP games aren’t as accessible to everyone. (Some people, myself included, just don’t enjoy trying to assemble all the little components. We’d rather let publishers do that). However, BSG Express continued to be developed and now it is a fully published game, and it’s no longer set in the BSG world, and it is called Dark Moon. Players are a crew trapped on a moon base that has been infected by some sort of organism, that’s turning the crew against each other. Also, all sorts of technical issues are cropping up. Now they have to solve their problems, fix up the base, and figure out who has been infected… before the infected destroy the station once and for all! If you’re familiar with Battlestar Galactica, you’ll recognize many of the elements. Each turn you refresh your dice pool, take one action, then face a task which generally requires all players to contribute or bad stuff happens. Players have a pool of 4 dice, and the dice have lots of negative numbers and a few positive ones. The actions allow them to repair parts of the base, attempt to solve events, or issue orders to give another player 2 actions (instead of your one). 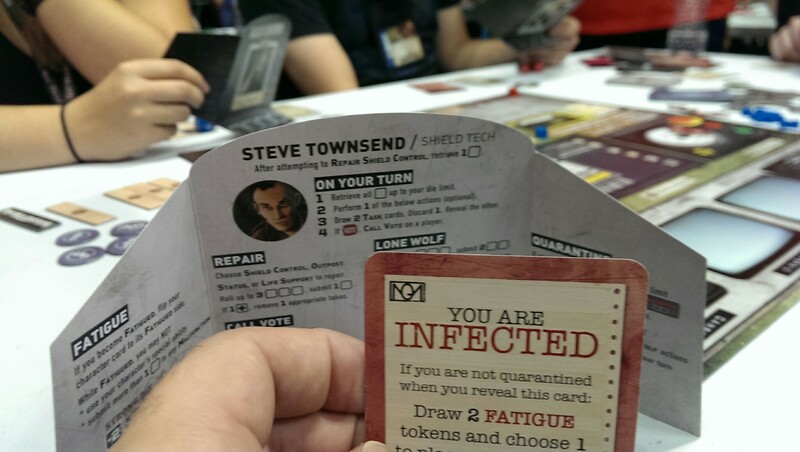 You can also call a vote to quarantine a player if you suspect they are infected, or reveal yourself as an infected to work some nastiness against the base. Actions tend to use your dice – and you need to roll a positive number to succeed in the action. Fortunately, you roll up to three dice and choose which to spend. When you face a task, there is a challenge level and a penalty for failure. The penalty usually involving damaging some parts of the base. Each player determines if they’re in or out for the challenge. If you’re in, you have to roll your dice and contribute at least one to the challenge. Even if you only roll negative numbers. These rolls happen in player order, and everyone who is “in” has to roll, even if the challenge total is reached early. Which means you could end up accidentally failing a task (or purposefully) after the other players rolled really well. Which means they might want to risk boosting it up higher to allow for wiggle room. Also, once you spend your dice, it’s hard to get them back before your next turn, so you might want to hold some back for the next task(s) you’ll have to face. Oh, and all dice rolls are secret. 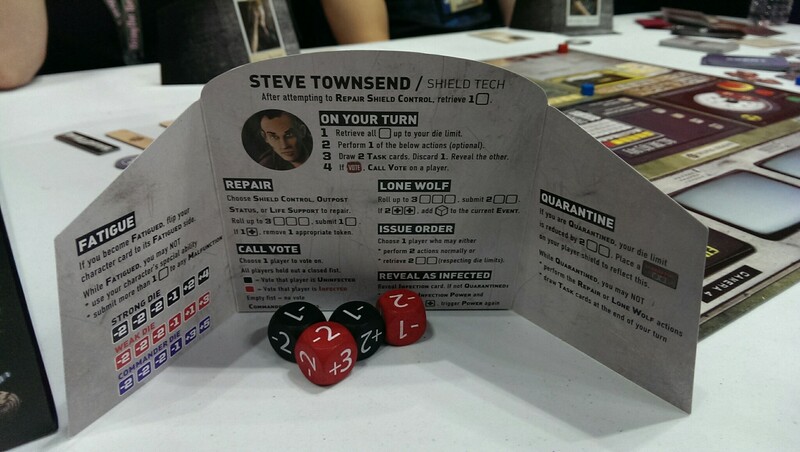 This allows infected players to bluff and pretend like they rolled poorly even with a +4 die sitting right behind their screen. Of course, too much failure too quickly and you may out yourself… so yeah. It’s like BSG. The demo was enjoyable, and the dice-rolling thing worked really well. 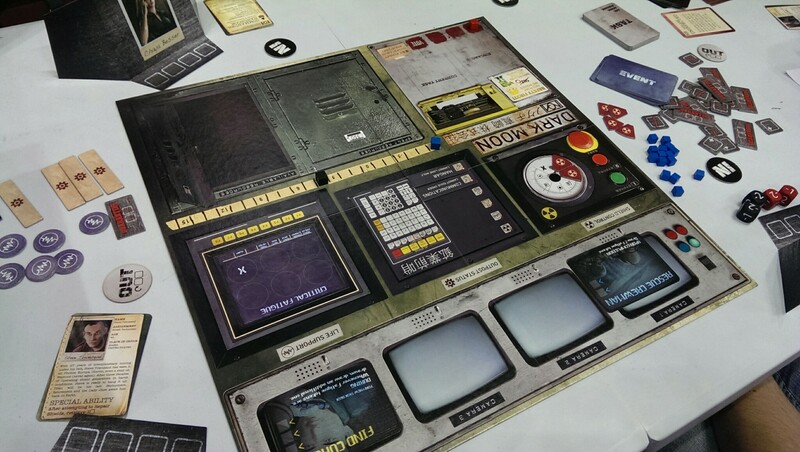 I will say, in our demo it was incredibly easy for the Infected to fail tasks and the game ended before even the first round. If this was common, I wouldn’t be too thrilled. I think that we were started with extra damage just so the game would go quickly and we could get a feel for it, but I’m not sure. I do look forward to toying around with this one more, because if my suspicious are right, it’ll be a really need replacement for BSG in a pinch when you don’t have three hours on your hands. On your traitorous, infected hands.